The Hess law says that “the change in enthalpy that occurs when the items are transformed into products is the same, so if the reaction takes place in a single stage as if it occurs in several stages”. 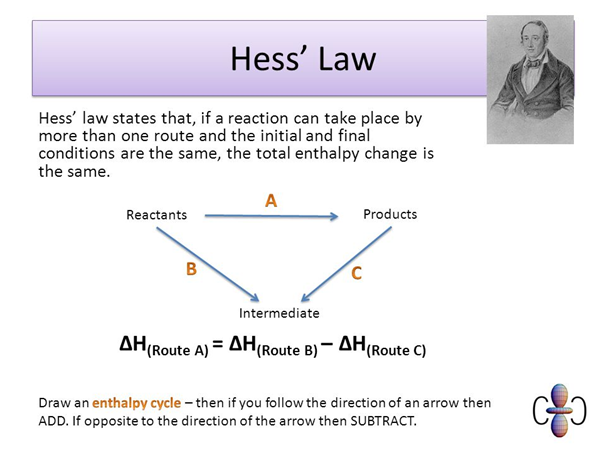 from a practical point of view the Hess law allows to calculate the enthalpy (energy) of a reaction if you known reactions (or roads) alternatives. According to the law of Hess the total energy of the reaction is the same “If you follow the red path or the blue road”. What we really want is only State (reagents) initial and final State (products) of the system.